Calicut Heroes got the better of Ahmedabad Defenders 4-1(15-14,11-15,15-11,15-9, 15-8) on the 12th day of the ongoing Pro Volleyball in Kochi to continue their winning run. Jerome Vinith was the top scorer for the Heroes with 17 points while Novica Bjelica scored the most for Ahmedabad. It was an interesting start to the match as Ahmedabad nosed ahead with a 5-3 lead owing to two errors from Calicut and three points scored by Novica Bjelica and Victor Sysoev. But Calicut showed why they were table-toppers pulling back things together and taking the lead at 8-6 at the first Technical Time Out (TTO). At 12-10, Calicut looked on their way to win the set but Ahmedabad called for a Super Point and converted on Calicut’s serve to level the equation. The last few points were hard fought and it looked like anyone’s set till 14-14. It was finally a spike by Paul Lotman which won the set for Calicut 15-14. In the second set, Ahmedabad yet again went into an early lead but as it was the case in the previous set Calicut came back to level it 5-5. Ahmedabad was determined not to fall behind and went into the TTO an 8-6 lead. Calicut called for a Super Point at 6-9 and converted to close the gap to 8-9. Ahmedabad extended the lead even further as they went to 13-10. 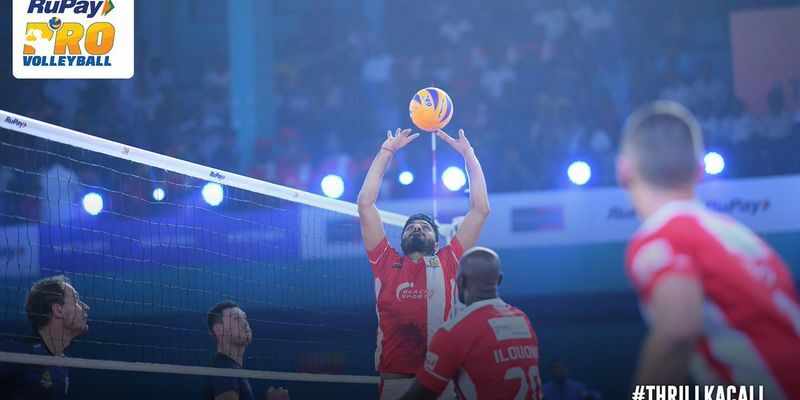 At 14-10, Ahmedabad had their first set point but could only seal the deal at 15-11 when Vipul Kumar’s spike went out. The match was now level at 1-1. Winning the second set seemed to have given Ahmedabad the momentum as they led 5-2 displaying good attack and defence. Calicut was in no mood to let Ahmedabad run away with the lead and levelled the score at 7-7. Ahmedabad somehow entered the TTO with a point advantage. After the TTO it was a neck-to-neck battle as no team was able to widen the gap. Ahmedabad called for a Super Point at 10-11 but failed to convert as Lotman’s spike was too hot to handle. Calicut won the set as Ajith Lal closed it 15-11 with an inch perfect spike. Calicut led 2-1 in the match. As the fan support increased, Calicut raised their game taking an 8-1 lead with Lotman acing a Super Serve at 6-1. Ahmedabad seemed to have lost their way. The conversion of a Super Point by GR Vaishnav also seemed futile as the gap of points was too much to handle. Calicut won the set 15-9 that ensured an unbeaten end to the league stage for Calicut. The last set wasn’t much of a competition as Calicut won the same by a score line of 15-8 winning their Super Point and acing a Super Serve both converted by skipper Jerome Vinith. Though, Ahmedabad won their Super Point at 6-10 but they never looked like being in the game. Calicut won the match 4-1.